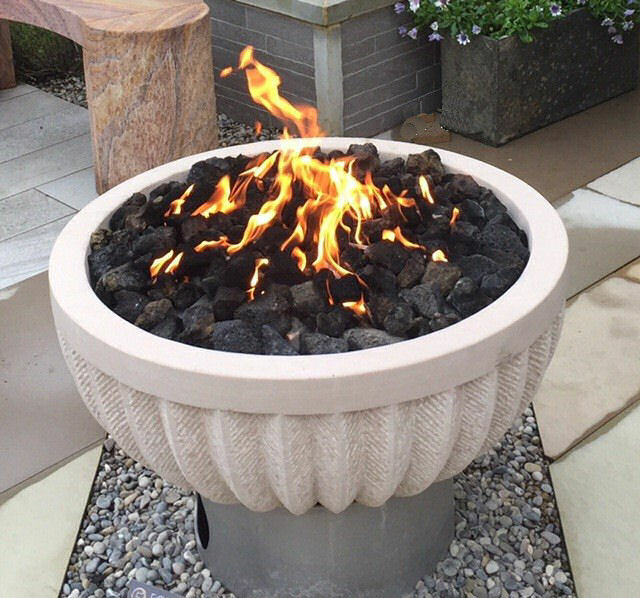 This model created with the finest Indian rainbow sandstone, measuring 75cms Diam by 57cms high weighing 160kg incorporates our round BrightStar Burner™. Each sandstone bowl is seated on a marine grade brushed stainless steel plinth. It also has a cover which turns it into a nice coffee table when you’re not using it as a FirePit. The thick sandstone stops the bowl from overheating but will stay warm for hours after the FirePit is turned off. Included are lava rock to cover the burner, a 4m hose and clips (LPG model only) ready to connect to your bottle regulator. Please Note: Natural stone is a product of nature and as such no two are the same. There will be variations in colour and in the hand finished patterns and texture. These differences are part of the beauty of sandstone. 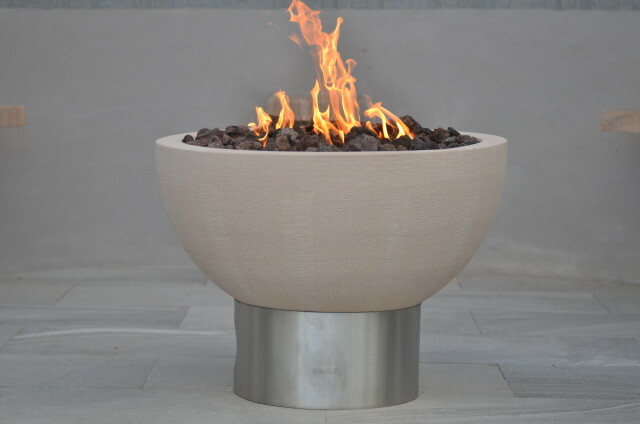 This model created with the finest beige sandstone, measuring 75cms Diam by 57cms high weighing 160kg incorporates our round BrightStar Burner™. Each sandstone bowl is seated on a marine grade brushed stainless steel plinth. It also has a cover which turns it into a nice coffee table when you’re not using it as a FirePit. The thick sandstone stops the bowl from overheating but will stay warm for hours after the FirePit is turned off. 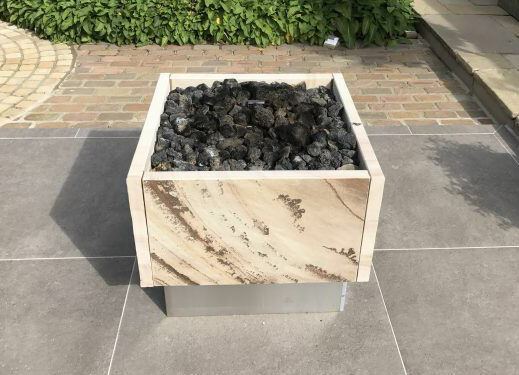 This model created with the finest fossil sandstone, measuring 75cms x 75cms by 57cms high weighing 160kg incorporates our square BrightStar Burner™. 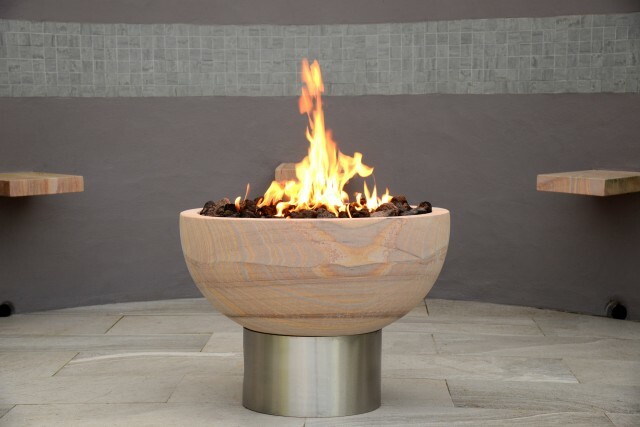 Each sandstone firepit is seated on a marine grade brushed stainless steel plinth. It also has a cover which turns it into a nice coffee table when you’re not using it as a FirePit. The thick sandstone stops the bowl from overheating but will stay warm for hours after the FirePit is turned off.